SEOUL, Nov. 7 (Yonhap) -- The presidents of South Korea and the United States agreed Tuesday to completely remove the limit on the payload of South Korean ballistic missiles and discuss Seoul's introduction of nuclear-powered submarines and other advanced weapons, Seoul officials said. The agreement aimed at building up their joint deterrence against a provocative North Korea was made at a bilateral summit between President Moon Jae-in and President Donald Trump at the South Korean presidential office Cheong Wa Dae. "The heads of South Korea and the United States reached a final agreement on removing the limit on missile payloads," Moon said in a joint press conference with the U.S. president. Trump arrived here earlier Tuesday on a state visit, becoming the first U.S. president to do so in 25 years. 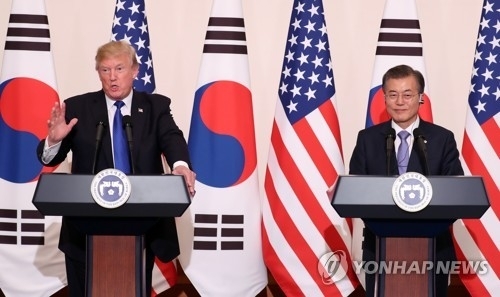 The leaders also agreed to expand the rotational deployment of U.S. strategic assets to South Korea and its surrounding areas, Moon said at the nationally televised press conference. "We agreed to immediately begin negotiations on South Korea's development and acquisition of the most advanced military surveillance assets," he added. A Cheong Wa Dae official later explained the discussion included Seoul's development or acquisition of nuclear-powered submarines. Nuclear-powered submarines are considered asymmetrical assets that can intercept North Korea's submarine-launched ballistic missiles, but are currently prohibited under a nuclear pact between Seoul and Washington. Moon said he and the U.S. leader reaffirmed their resolve to peacefully end the North Korean nuclear standoff. They, however, stressed the importance of having what they called "overwhelming" strength over North Korea. "We are showing great strength and I think they (North Korea) understand we have unparalleled strength," Trump said. The U.S. leader said he did not wish to use force against North Korea but will if necessary. "You know we have sent three of our largest aircraft carriers in the world and they are right now positioned. We have a nuclear submarine also positioned. We have many things happening that we hope to God that we never have to use," he said. "With that being said, I really believe it makes sense for North Korea to come to the table and to make a deal that is good for the people of North Korea and the people of the world." The U.S. president said his country and South Korea will continue to work together to defend what they have worked so hard to build. "We cannot allow North Korea to threaten all that we have built. We have built it very much together and we are very proud of it, also together," he said. Trump's trip to the country came about two months after the North staged its sixth and most powerful nuclear test so far on Sept. 3. The U.S. leader urged all countries, including China and Russia, to faithfully implement U.N. Security Council resolutions against North Korea, calling the North's latest nuclear test and subsequent missile launches a threat to the entire world. "North Korea's sixth test of a nuclear device and its missile launches are a threat not only to the people of South Korea but to the people all across our globe. We will together confront North Korea's actions and prevent the North Korean dictator from threatening millions of innocent lives," Trump said. "All nations must implement U.N. Security Council regulations and cease trade and business entirely with North Korea. It is unacceptable that nations would help arm and finance an increasingly dangerous regime," he added. The U.S. president also reaffirmed his country's commitment to the defense of South Korea. "As we work together to resolve this problem using all available tools short of military action, the U.S. stands prepared to defend itself and its allies using the full range of our unmatched military capabilities if need be," he said. The Moon-Trump summit also discussed trade issues as the U.S. leader has long insisted on the need to narrow his country's trade deficit with South Korea. "We have the greatest military equipment in the world and South Korea will be ordering billions of dollars of that equipment, which for them makes a lot of sense and for us means jobs and reducing our trade deficit with South Korea," Trump said. Seoul and Washington are already in the process of revising their bilateral free trade agreement (FTA). The U.S. president said he was confident the sides will reach a free, fair and reciprocal trade deal. While earlier meeting with Moon in an expanded summit, Trump welcomed Seoul's proposed purchase of U.S. military equipment, noting the amount the country will be ordering "will substantially increase, and therefore bringing the trade deficit down, which is very important to our people." "We have trade deficits with numerous countries and we don't want trade deficits, so we appreciate that very much," he said, according to a video feed of the summit broadcast live and later posted by the presidential office Cheong Wa Dae. Trump was later scheduled to attend a state dinner to be hosted by the South Korean president and his wife, also involving some 120 government officials and business leaders from both countries. The U.S. president will head to China on Wednesday, after delivering a special speech at the South Korean National Assembly, also becoming the first U.S. president to do so in 24 years.